In 2014, Olay reinvented themselves with a new campaign and an entirely new brand message: "Your Best Beautiful." Along with this rebrand, came the opportunity to rethink their existing email marketing strategy – which, between its struggling subscription numbers and outdated look & feel, really needed a new approach. We approached the client with a new eCRM strategy and design, and they immediately "subscribed" to it. With that, we introduced Club Olay. I led the force on the redesign. Striving for high impact visuals and an editorial-style approach to the design I was able to create a premium look and feel that delivers the content the consumer wants in a visual style that is both beautiful and quickly scannable. While approaching the new redesign of Club Olay, I wanted to create a nimble template that allowed for flexible customization. Thus, each email feels distinct and uniquely crafted. 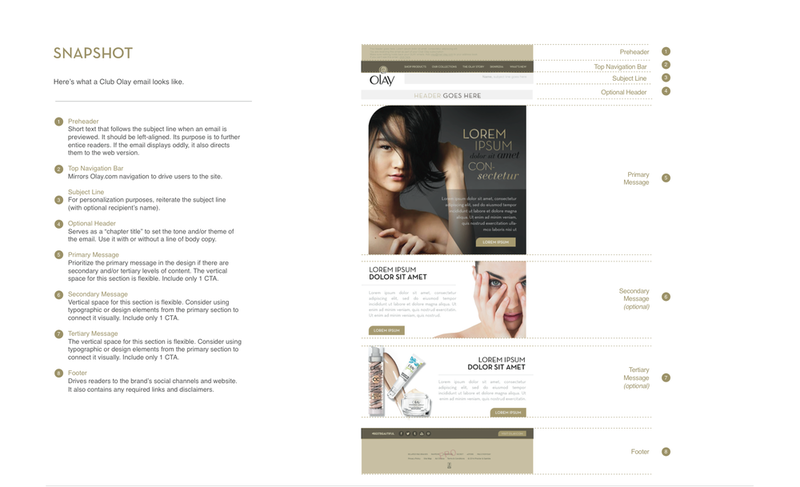 I was also tasked with creating a global style guide for Club Olay deployment across all of Olay's markets. This task proved to be a challenge as we had to ensure that the editorial look & feel (which is sometimes hard to create strict guidelines around) would not be lost in translation.